POSTED: Sat, 05/02/2015 - 16:00 | POSTED BY: Traci C.
There's more technology testing happening at the Walt Disney World Resort, this time at Disney's Hollywood Studios. The latest test is happening at the Backlot Express and involves pre-ordering your food for the quick service spot. There's also a test of in-seat food delivery during Fantasmic! performances. The Backlot Express test is happening for a limited time (until May 12) and works like this: if you have indicated that you'll be visiting Disney's Hollywood Studios via My Disney Experience you'll receive an email inviting you to participate in the test of pre-ordering food from the Backlot Express or from the Fantasmic! concession area. You'll need to download a free app called "Express Order" and once you open the app you'll see the choices of Backlot Express or Fantasmic! concessions. For Backlot Express pre-orders you can choose your food for pick up or to go, the difference being the "pick up" option means your food is served on a tray and the "to go" option is in a bag, to go. The full Backlot Express menu is available during this test period and you can choose your entrees, sides, desserts, and beverages with the app. When you've completed your order just choose "checkout" and you won't pay for your food until you pick it up. You'll need to provide an email and credit card to complete your order. The Disney Dining Plan is not currently accepted for this pre-order test. The Fantasmic! test for in-seat delivery is for specific items including popcorn, hot dogs, and Mickey Pretzels. You will place your order for these items once you've arrived in your seat for Fantasmic! as the ordering option is not available until just prior to showtime. You can also order merchandise to be delivered to your seat including some of the Made with Magic items like the ear hats and wands. In order for your food, drinks, or merchandise to "find you" in your seats you'll need to have location services turned on in the Express Order app. This test is for a limited time and there's no word yet on whether it'll be tested in other parks. 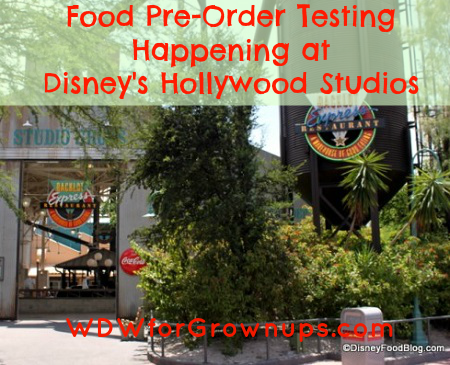 Are you visiting Disney's Hollywood Studios during this test period? Leave us a comment and us know if you'll be testing out the pre-order system. Thanks to the Disney Food Blog for use of their photos. I think the in seat delivery for Fantasmic is awesome, I hope that the test goes smoothly because it's a great idea!